WHO IS MCFC & NCMC? The Moreton Celtic Fiddle Club and Norfolk Celtic Fiddle club are 2 groups of energetic and talented Celtic musicians who meet monthly to play/learn Celtic and Bluegrass tunes. MCFC started in 2007 and is known for being one of most entertaining groups in the Celtic Fiddle Group scene. Performing Regularly at community and private events and functions as well as Celtic Festivals around the state. NCMC started in 2017, although a newer group they are growing steadily and now join MCFC on all of their performances. 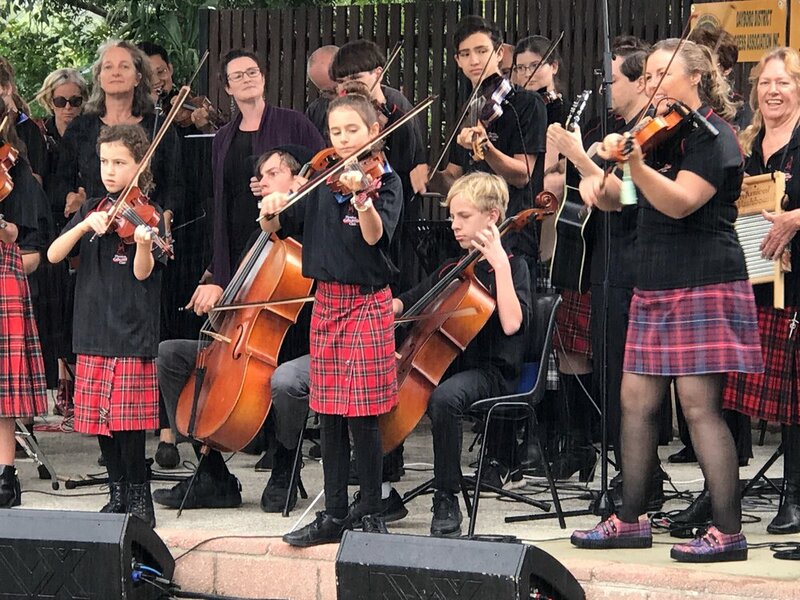 Both groups growth can be attributed to the welcoming approach and the fact that our Music Director Melinda Coles teaches by dots and by ear encouraging members to then perform without music. Many of our members have had the opportunity to attend and perform at camps/workshops/masterclasses in Australia and overseas. Musicians as young as 4 and adults as old as 80 join in and play together in rehearsals and performances. Moreton Celtic Fiddle Club and Norfolk Celtic Music Club are open to one and all providing you play a fiddle/Cello/Guitar/tin whistle/piano/drum/banjo/bass/bodhran/spoons at least a little bit and have a love for Celtic music. Held Monthly for fiddlers, cellists, guitarists, and Celtic musicians. You will need to bring Your fiddle, Cello, guitar, mandolin, tin whistle, recorder, Harp, Bodhran, double bass, banjo, viola and a music stand! Please contact Melinda Coles for further info. Images on this site belong to Moreton Celtic Fiddle Club.